Some days I can't decide if I want an entire bar of dark chocolate, a full-fat vanilla chai latte, or maybe just a jar of peanut butter to myself. Anyone else? Normally I can settle for a dark chocolate, peanut butter protein bar or even a few scoops of Halo Top, but if you're an avid bar/healthy ice cream buyer, you know how expensive that can get! I will say, Halo Top has come down in price around here (and hopefully for you too) and I'm wondering if it's because of other brands putting out the same concept? *hint hint Breyers I see you. Well it's a win win for everyone, more ice cream = lower prices, and all is good for some late night indulgences. BUT (let's focus here Hanna), buying healthy snacks, bars, and treats can definitely rack up some dollars and hide some pretty unhealthy ingredients. Sometimes I think back to the protein bars that I used to eat and just shake my head. I had no idea that most of the synthetic protein bars are filled with preservatives, chemicals, and sugar substitutes that can cause some major problems for both your digestive system and endocrine system (hormones). The past is the past and I am happy to say that every protein bar I eat is completely free of any toxins and totally beneficial for my body. But again, they can get very expensive, very quick! After moving out/quitting my job/working with a budget, I had to start coming up with a better solution. I remember always seeing "energy" or bliss balls all over Instagram and in every coffee shop in LA, but never anywhere in my hometown of Ohio. 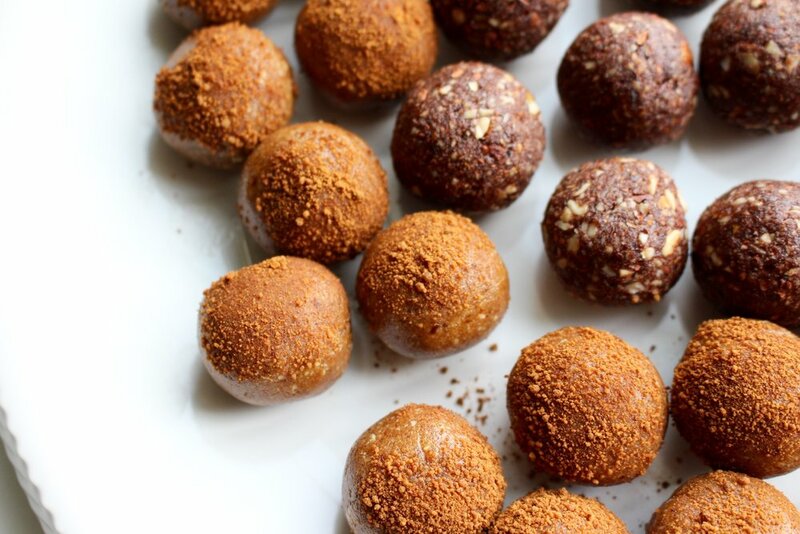 With my food processor in hand, I decided to get creative and start making my own batches of energy, protein, and bliss balls! 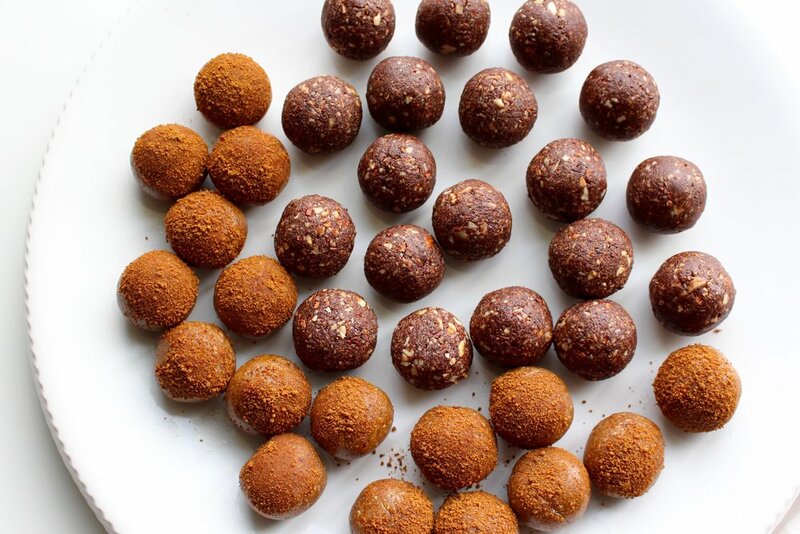 These were some of my first recipes: Brain Happy Energy Balls, Green Cacao Energy Balls, Simple Sprouted Crunch Balls, and my latest Almond Cacao Energy Balls. I love them all equally! As I was getting things ready for our trip to Nashville and planning snacks/food to bring, I knew I had to test out some new ball recipes! 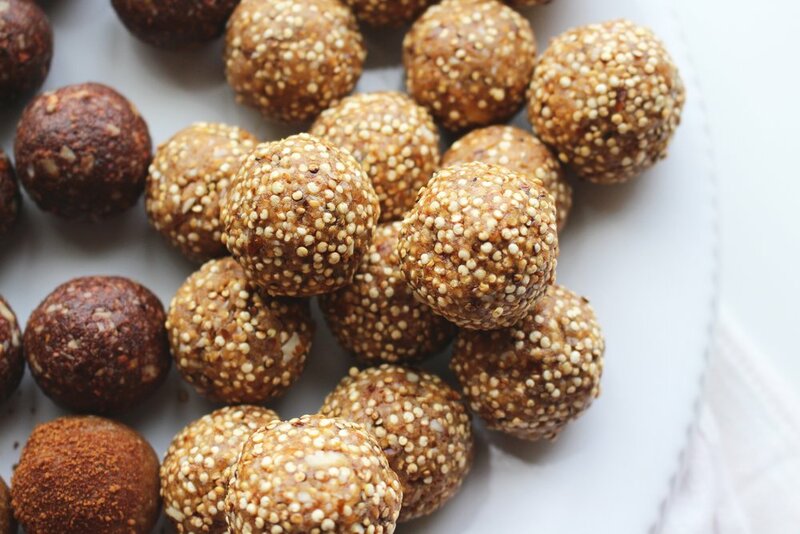 They are the perfect bite sized snack that packs a ton of naturalproteins, heart healthy fats, and even hormone happy adaptogens. I went with a spread of different flavors so that each was very different from the next. Chad even suggested a flavor that turned out to be our favorite! I hope you enjoy this type of multi-recipe post & be sure to let me know if you give these a try by using the hashtag #thehealthiestme! Place all of your ingredients into a food processor and blend on high until the dough comes away from the sides. Roll into 18-19 one-inch balls and enjoy! Add everything to your food processor and blend on high for 1-2 minutes. The batter will completely come away from the sides of the blender and will be very smooth and soft in texture. Roll into balls, add additional toppings, and then place in the refrigerator to set and cool. Nutty, crunchy, and packed with protein! Next, add all of your ingredients into a food processor and blend on high. Once you have reached a stick consistency and the dough comes away form the sides, it is ready to go! Carefully fold the roasted quinoa into the date mixture and completely combine. Roll into 22-24 one-inch balls and let cool!